Legendary comics and graphic novel artist and writer Will Eisner died last night, Monday, January 3, 2005, in Fort Lauderdale, Florida, at the age of 87, following complications from quadruple heart bypass surgery. I frightened my neighbor's cat, visiting in my office, with my plaintive cry of "Oh, no!" Hadn't it been reported that Eisner had come through the surgery in good shape? Wasn't he expecting to be back at work by the spring or sooner? Why was the universe doing this to us? Once I got through the various stages of grief to acceptance, I started thinking if there was something I could do, something I could write, which could be sufficiently brilliant to honor one of the most brilliant creators the comics industry had even been lucky enough to know. I came up blank. 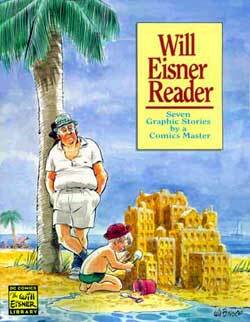 Far better journalists than I will be telling you of Eisner's life and his amazing accomplishments. I can only add that he was an inspiration to every comics creator worth a fig. 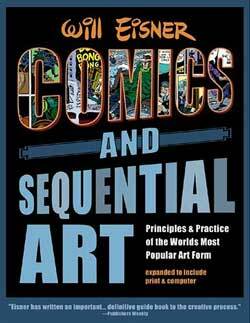 More perceptive students of the comics art form will elucidate his artistic contributions to the field. I learned from his books on sequential art and from his stories, but I lack the language to explain what I learned and how I used it. People who knew him far better than I did - we talked maybe a couple dozen times over the years, once sharing information on the vertigo we both suffered from - will be able to paint for you the picture of a truly great man who also an uncommonly good man. His kindness to creators and fans has been and will continue to be held as the standard few others will ever attain. I feel like the little drummer boy of Christmas myth. I have no gold, no frankincense, no myrrh to offer to the memory of this great man, even if I were entirely sure what those last two things were. It's a no go on the drum, as well, because I couldn't carry a tune if I had a kangaroo's pouch. I went through dozens upon dozens of Eisner covers before the one which runs at the beginning of today's column revealed itself to me. I can't recall the comics story it illustrates, if, indeed, it illustrates any story, but it struck me as being representative of Eisner watching the comics creators who've followed in his large footsteps building on his legacy. Maybe I'm reaching for a meaning that isn't there, but I'll take my scarce comfort wherever I can, any relief from that lump in my heart. I have another "gift" for Will Eisner, though it's really more a suggestion of a gift that the comics industry itself can give him in the months and years to come. At age 87, Eisner was still creating comics as remarkable as he ever had, as remarkable as those created by artists and writers who were his juniors by decades, sometimes half a century and more. In an industry that has rarely embraced its older creators, he was shining proof that entertaining and even innovative voices need not be stilled by age. That should be as much a part of his enduring legacy as the Spirit, A Contract With God, Comics & Sequential Art, The Dreamer, and his other works. The Will Eisner Spirit Award. Each year, a panel of industry judges would review the current work of comics artists and writers over a certain age - 65 comes to mind - and select one to receive a figurine modeled after Eisner's most famous creation in recognition of their continuing creativity in the comics arts field. I don't know what it would take to make this idea a reality. I don't know that there aren't a dozen reasons why this might be a bad idea. I just think - and mostly hope - that this is the really good idea I want it to be. For Will Eisner and for all the other comics art creators who have entertained readers their entire lives. It was either this or a drum. Generous as he was, I think Eisner would prefer I not pick up the sticks in his memory. Thanks for all the wonderful comics and astonishing insights, Will. I'll never forget them or you.